I have been writing for many years, mostly short stories. 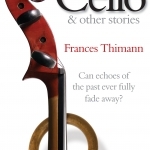 My collection ‘Cello and Other Stories’ was published by Pewter Rose Press in October 2008. These eight stories focus on the theme of old age, as perceived directly by those at the end of their lives, and indirectly by their families and others around them. ‘Col’ – in ‘Lanterns’ published by Laundrette Books, 2005. ‘Myths’ – in ‘Mezzanine and Other Storeys’ published by Ardra Press, 2007. ‘Mrs Rosenfarb’ – in the literary magazine ‘Staple’, 2008. I have also enjoyed writing some little stories for my two young great-nephews, and printing them, with illustrations by local artists. I completed the MA in Creative Writing at Nottingham Trent University in 2006.